One of the most exciting aspects of my role is surveying the collections housed at the Main Library and the University Collection Facility (UCF). This gives me to opportunity to look at collections I would not usually come into contact with, and I get to discover what is in the University’s vast collections. The purpose of these surveys is to determine any conservation work which needs to be carried out to safely house the collections and preserve them for future use. Some of these collections have already been appraised by archivists and some are awaiting appraisal. I create the surveys in Excel and write a report of my findings. The report records the current condition of the collection, lists the types of materials found, gives recommendations for future housing, and provides a cost estimate for the materials needed to carry out the work. Due to the success of last year’s ‘Crowdsourcing Conservation’ event, we are repeating the session on 19 and 20 February 2018! You can read more about last year’s event here. 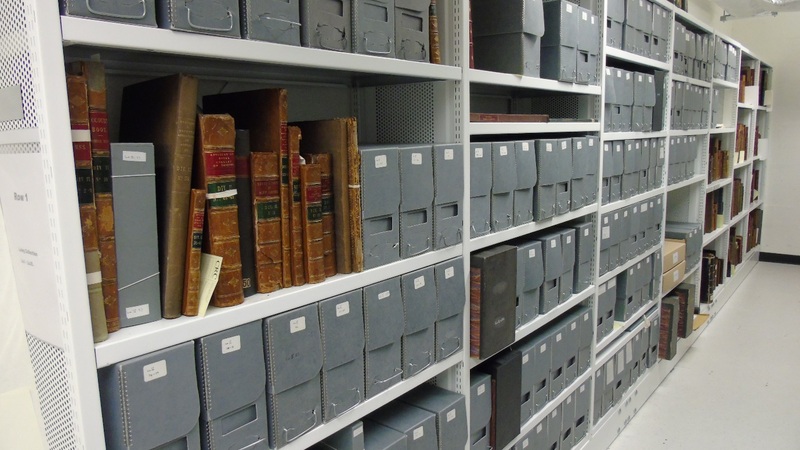 This year, we will continue to work with the Laing collection, this time rehousing section IV. 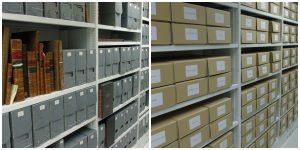 Over the two-day period we aim to rehouse 96 boxes, completing the boxing of the Laing manuscript material. Damage has been caused to these collections due to the current storage in vertical boxes. Folders have slumped in under-filled boxes, and caused planar distortion of the papers. Tearing and creasing has occurred due to the lack of internal protection. To solve this problem, we want to rehouse the collection in acid-free folders and boxes. Each day will consist of a training session in the morning, followed by practical work. In the afternoon, students will be joined by staff members from the CRC who will talk to them about their roles, whilst helping to carry out the conservation work. Good quality complimentary refreshments and catering will be provided throughout the day to encourage networking during break times. This is a great opportunity to get some hands on experience with special collections, and find out what it’s like to work at the CRC! Places are limited to 15 participants per day. You can book your place through Eventbrite. If you have any questions, please email emily.hick@ed.ac.uk. Booking will close on 8 February, to allow us to organise catering. Book now, don’t miss out! During the Festival of Creative Learning (20-24 February 2017), we will be hosting our first ever conservation crowdsourcing event! 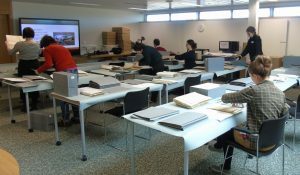 Over a two-day period (20-21 February), with the help of 30 participants, we aim to rehouse section II of the Laing manuscripts – the University’s most important written collection. Laing’s collection of charters and other papers is of national importance and the most distinguished of its kind in any Scottish university. It is an essential resource for the 18th century, however, it is in poor condition due to its current housing in unsuitable upright boxes and folders. It is an extremely popular collection, but it is difficult to access and there is a risk of further damage every time it is handled. 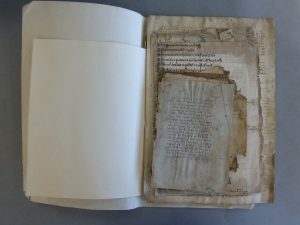 It’s not every day that you are asked to conserve a magic spell on papyrus, but this is exactly what happened when I was asked to take a look an ancient fragment of text, recently discovered in the archive collections at the CRC. 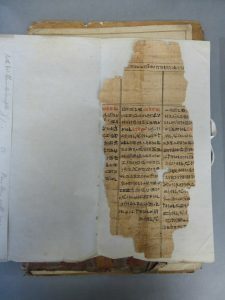 The fragment was unearthed by an archives intern who was assessing the foreign language material in the David Laing collection. A vague catalogue entry labelling the box as miscellaneous languages, and an inscription on the folder wrongly identifying it as Chinese script, meant that this item had not been consulted for years and the staff were unaware of its existence. It has been suggested that it could be an Egyptian spell from the book of the dead, but further research is needed to confirm this.